This time of year I am always struck by the commercial craziness that has taken over this season. Every commercial, every radio advertisement and even social media – everybody is trying to sell something. 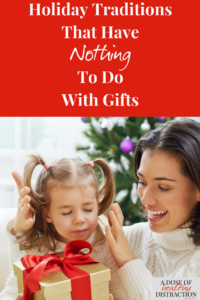 While I have moved past my issues with Santa, I definitely have not made peace with the idea that my child needs a pile of gifts on Christmas morning. I don’t want him to think that is the norm. The thing is, he doesn’t “need” any of the gifts he will get. I am big on the difference between wants and needs. I am also big on making sure my son’s memories of Christmas involve family and community service activities. Not just presents. Here in my hometown the local YWCA has a program whereby you adopt a family, shop for them, and then drop off the gifts by a set date. I know several small business and families who have done this in the past and it is always a rewarding experience. Yes, I admit this involves gifts but it shows our children that giving is more important than receiving. And if you do not want to buy gifts from a wish list, you could always provide a holiday meal to a family in need. This year my son and I also picked out a few gifts for children in his school whose family’s were in need. We purchased simple things like school clothes, shoes and family games. E really enjoyed the idea of helping children in his own school. Since our normal arrangements have changed, I have been considering other ways for us to spend our Christmas Eve. I am attracted to the idea of volunteering at a local food bank and serving a meal. Consider ways your children could volunteer with you. Volunteering as a family is a great way to make memories. Most small children enjoy sorting, so you could always collect and sort canned and dry goods and make a donation. I noticed that my local food bank actually takes “behind the scenes” volunteers, so you do not necessarily have to serve food; there are lots of ways to get involved. My son absolutely loves looking at Christmas lights. He loves driving around and pointing them out, and he adores those giant blowup lawn Santas. This year he got really into helping out when Dad put lights outside of our house. When he was little we used to drive around so he could see the cool displays people did. About 2 years ago we started going to one of our county parks to walk through a professional light display. Rocky Ridge Christmas Magic is so much fun. The added bonus of going to an event like this is that you are on your feet walking, so you get a bit of needed exercise. Normally I am super weird about what my child eats. During the holiday season I do allow him some treats in the form of cookies and a chocolate Christmas Calendar. The pieces are pretty tiny in the calendar. This is obviously not a health tip. Baking is more about memories than the food itself. To this day I look forward to my Grandma’s cookies. Not so much because I love cookies, but because it has always been something I could do with her. Now 87, she still makes everything from basic chocolate chip, to cut outs and pizzelles. I swear she makes like 12 different kinds! Remember that song from the Beastie Boys, She’s Crafty? Yeah well, crafty is not a word that would describe me. I do not sew, paint, scrapbook or draw. The last time I used a glue gun I burned myself and had a blister for a week. My mother actually makes all of the outdoor wreaths and door décor for my house. This year we had a few friends come over and we made ugly sweaters. Or embellished ugly sweaters we already owned. It was great fun and everyone involved will remember it for quite a while. If you are like me, and do not have a crafty bone in your body I encourage you to befriend someone who is good at this stuff. It seems like we have done the same thing or things every year for so long. Several years ago, some friends of ours (who are actually Jewish) started a Christmas Eve Power Hour. At the time there were no children involved, so the adults all got together and attempted to drink every minute for an hour while listening to TV show themes. It was hilarious. The hangover not so much. Now that we all have children and grandchildren our yearly tradition is changing. The point is there is nothing wrong with forming new traditions. Just because we get comfortable doing the same things in the same place with the same people every year, doesn’t mean we are incapable of enjoying something new. Grab your family and start a new tradition this year! Talk to your children about Christmas and what it means to give back. Or even more important, just be together. The holidays don’t have to be all about the gifts all the time. There are so many fun and educational activities out there just waiting to be discovered. What do you like to do during the holiday season that doesn’t involve gifts? Do you have any favorite holiday activities you can share?